The recent interview with Colombian Minister of Defence Luis Carlos Villegas, in which he said that the vast majority of killings of human rights defenders in Colombia were due to “problems in their personal lives, such as quarrels with their neighbours or romantic partners or their involvement in illegal economic activity is a denial of reality and amounts to nothing less than an calculated smear campaign against human rights defenders. Sr Villegas has also stated that apart from killings carried out by members of the ELN and the FARC, only 50 community leaders and HRDs were killed in 2017. The Minister’s statement is a convenient work of fiction which bears no relation to the harsh reality of life for HRDs in Colombia. The state’s own Human Rights Ombudsman has stated that 204 community leaders and HRDs have been killed in the last two years, while the Attorney General, Nestor Humberto Martinez, has identified “systemic criminality” in the assassination of social leaders — something the government has always denied, despite the evidence presented in numerous human-rights reports. In its Annual Report for 2016 Front Line Defenders reported 86 killings of HRDs, the vast majority of which have never been fully investigated. 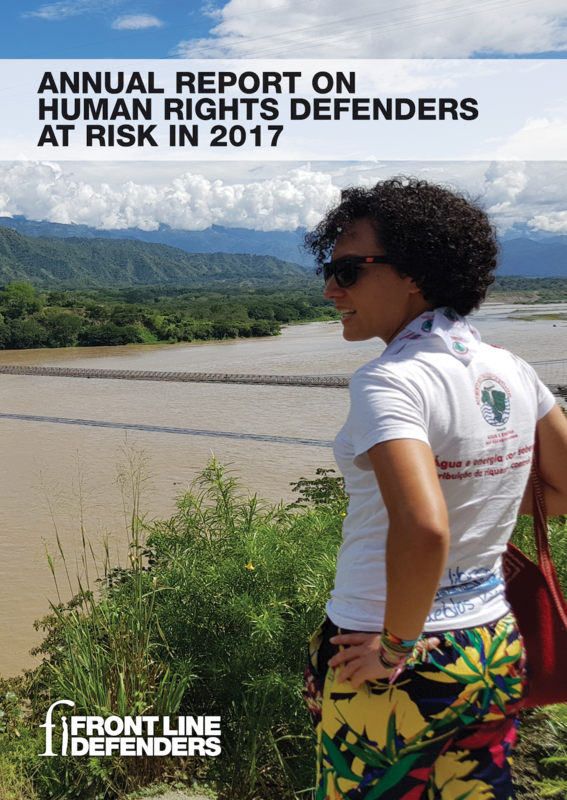 In its report for the first six months of 2017, Front Line Defenders partner organisation, Programa Somos Defensores, documented 52 cases of killings of HRDs in the first six months alone of 2017. The Front Line Defenders Annual Report for 2017 which will be launched in January 2018 is likely to report a similar level of lethal violence. While the Minister maintains the official line that there is no pattern of organised paramilitary activity the facts tell a different story. On 31 July 2017, Front Line Defenders reported a fresh wave of threats from members of Autodefensas Gaitanistas de Colombia (AGC), a paramilitary group operating in the municipality of Barrancabermeja, among others. The group circulated a pamphlet naming several rights groups and five defenders known for their work in the Colombian peace process. The Minister’s statement is a political smokescreen designed to relieve the pressure on the government from the international community to deal with the issue of the killings of HRDs. “Front Line Defenders welcomes the fact that the State Prosecutor has initiated an investigation into the Minister’s statement but believes that the government of Colombia must immediately disassociate itself from the Minister’s comments and reiterate it’s full commitment to human rights and the protection of human rights defenders, as an integral part of the peace process”. said Andrew Anderson, Executive Director of Front Line Defenders. At a time when the Colombian peace process is entering a critical phase, one of the key elements in guaranteeing the successful future implementation of the agreement is the restoration of trust in the institutions of state and in particular the criminal justice system and the security apparatus. “At best the Minister’s statement shows a lack of understanding of the risks faced by human rights defenders in carrying out their peaceful human rights work. At worst it shows a cynical willingness to misrepresent the reality in which HRDs are attacked and killed on an almost daily basis”, said Anderson. The prevailing climate of almost absolute impunity for these attacks on human rights defenders continues because of the lack of political will to address the systemic flaws in the state’s response to endemic violence, which the Minister, as the person in charge of the armed forces of the state, has a direct responsibility to address. Minister Villegas no longer has any credibility. Colombian community leader Hernan Bedoya, who defended collective land rights for Afro-Colombian farmers as well as local biodiversity in the face of palm oil and industrial agriculture expansion, was shot dead allegedly by a neo-paramilitary group on Friday, Dec. 5. Bedoya was owner of the “Mi Tierra” Biodiversity Zone, located in the collective Afro-Colombian territory of Pedeguita-Mancilla. The land rights activist stood up to palm oil, banana and ranching companies who are accused of engaging in illegal land grabbing and deforestation in his Afro-Colombian community’s collective territory in Riosucio, Chocó. According to the Intercelestial Commission for Justice and Peace in Colombia (CIJP), a Colombian human rights group, Bedoya was heading home on horseback when two members of the neo-paramilitary Gaitánista Self-Defense Forces of Colombia (AGC) intercepted him on a bridge and shot him 14 times, immediately killing him. According to Foundation for Peace and Reconciliation (PARES), 137 social leaders have been killed across Colombia in 2017. Other observers have found lower numbers, but most track over 100 killed over the course of the year. As one of more than an estimated 8 million people afflicted by five decades of armed conflict in Colombia, Bedoya had returned to his land with family in 2012 after being displaced by the United Self-Defense Forces of Colombia (AUC) paramilitary group in 1996. Following his return to the community, Bedoya fought alongside non-governmental organization to push back against powerful palm oil, banana and cattle interests. He wanted to ensure that the collective Afro-Colombian territory was protected from ongoing “invasions” that were cutting into his community agricultural lands and destroying protected areas set aside for their rich biodiversity. Bedoya allegedly began receiving threats from illegal armed groups beginning in 2015. According to CIJP, the Colombian state, through the National Protection Unit (UNP), had given Bedoya a cell phone and a bullet-proof vest in an attempt to protect his life. In June, CIJP denounced an industrial agricultural company for “destroying primary forests and resources for illegal industrial agriculture,” also claiming that their the group’s lawyer had singled out Bedoya’s biodiversity reserve as a target for parcelization and development. “They are cutting the forests, destroying subsistence crops and causing displacement when they take over the family farms to plant plantain and palm oil projects,” said CIJP to local media. On Thursday, 25 social leaders from Bajo Atrato and Urabá regions in Choco and Antioquia, who had received death threats or had relatives who were murdered, met in Bogotá to demand guarantees that they would be able to return to their territories. In order to protect their identities, the leaders wore masks to the press conference. The activists said they know of plans to kill several other land rights leaders in the region: Miguel Hoyos, Eustaquio Polo and María Ligia Chaverra, as well as two local communal leaders. Community leaders from Colombia, the Philippines and Uganda have been in London challenging attendees of the Mines and Money Conference. Protesters confronted by armed police. Leandro Taques. Cachoeira Escura, Minas Gerais, Brazil. Environmental and Human Rights Defenders (EHRDs) from the frontlines of mining struggles in the Philippines, Colombia and Uganda travelled to London to expose the true costs of the UK’s extensive ties to the global mining industry and oppose the Mines and Money Conference. The annual Mines and Money brought together more than 2,000 mining company representatives and investors hoping to cut deals that expand one of the world’s deadliest, most polluting industries. Keynote speeches were delivered by Arron Banks, the Brexit financier, and Nigel Farage, the former UK Independence Party leader.. They provided advice on how mining companies can most ably exploit the political and economic climate post-Brexit, especially with regards to extracting wealth from the global south. The delegation of frontline defenders formed part of a week of creative action called Rise, Resist, Renew: Alternatives to Mines and Money. The action was designed to highlight London’s role in the expansion of global mining destruction, reminding UK citizens that deals struck here often mean displacement, destruction and death for communities living on mineral-rich lands around the world. The express aim of Mines and Money, which took place last month, is to match-make big money with big mines, helping finance flow to new and undeveloped projects – it advertises itself as the event where ‘deals get done’. The mines that result are getting bigger, deadlier and more prone to catastrophic disasters. Mining is currently the world’s most deadly industry for the people who stand in the way of mining projects, and for those who lose lands and livelihoods to its operations. As a hub of global mining finance and power, London is a logical location for the conference. Many of the world’s biggest mining companies are listed on the London Stock Exchange and conduct their business through London. Still more companies are listed on the city’s Alternative Investment Market (AIM). British high street and investment banks, pension funds and insurance companies invest hundreds of millions of pounds a year in mining projects across the globe, connecting working people’s earnings in Britain with the struggles of mining-affected communities around the world. The mining industry also enjoys deep and longstanding connections with the UK government, which often gives UK-based mining companies diplomatic support overseas, even when their activities are opposed by local people. Just 101 companies listed on the London Stock Exchange (LSE) collectively control over $1 trillion worth of Africa’s most valuable resources, according to a 2016 report from War on Want. They are enabled by the UK government’s power and influence. The report highlights a pattern human rights abuses, forced migration and ecological destruction that is characteristic of neo-colonial extraction pervasive throughout the global south. This further demonstrates the UK’s role as a safe haven for the mining industry. Around the world, the operations of UK-linked mining companies are facing staunch resistance from communities seeking to protect land, water and livelihoods from the impacts of mining. This resistance is rendered invisible at Mines and Money, which presides over panels on ‘responsible’, ‘sustainable’ mining without seeking contributions from affected communities. Throughout the week of the conference, the delegation of EHRDs from Colombia, the Philippines and Uganda shared their experiences of the impacts of UK-linked mining projects in their territories, and of their resistance, with the UK public, NGOs and government officials. Camila Mendez from youth collective COSAJUCA in Cajamarca, Colombia, shared her experience of Cajamarca’s recent popular consultation on mining, in which 98 percent of residents who turned out voted to ban AngloGold Ashanti’s planned La Colosa gold mine. Throughout the week, Camila called on the UK to support popular consultations, even as Colombia’s Central government seeks to restrict them. Filipino human rights defender and Coordinator of Kalikasan PNE, Enteng Bautista, shared the violence environmental defenders opposing mining operations face in the Philippines as a result of mining interests, including those of British companies. The delegation of frontline defenders also took the opportunity while they were in London to share the alternatives to contested mining-based development, both in their territories and globally. Alice Kazimura from the Buliisa Women’s Development Association, Uganda, joined campaigners via video link to share her community’s experiences of resisting the operations of Tullow Oil, an Anglo-Irish oil company registered on London’s Alternative Investment Market. Alice’s community, Kakindo, is developing alternatives to the extractive mining-for-development model pushed by governments worldwide. “We are promoting alternative sources of energy, such as solar energy, so that we reduce dependence on fossil fuels and the need to extract more oil and gas”, says Alice. The delegation of frontline defenders and their UK allies repeatedly stressed that minerals and metals are finite, so a future beyond extractivism is inevitable. Rather than looking to a future of increased extraction to satisfy the minority economic interests behind extractive projects and over consumption in economically richer countries, we need to challenge an economic growth model that drives needless resource speculation, inequality, injustice, forced migration and climate change. This journey starts, in part, by bringing the nexus of extractive power to account in safe havens like London. “We are here (in London) and wherever the mining companies go, we will go, to tell them we are against extractivism”, says Camila Mendéz. Hannibal Rhoades is Communications and Advocacy Coordinator at The Gaia Foundation, a UK-based organisation working internationally to support indigenous and local communities to revive their knowledge, livelihoods and healthy ecosystems. Tatiana Garavito is a racial justice activist, an intersectional feminist and a co-founder of Organising for Change. Sebastian Ordoñez is the senior international programmes officer for War on Want. On 4 December 2017, Father Marcelito “Tito” Paez, coordinator of the Rural Missionaries of Philippines in Central Luzon, was shot dead in Nueva Ecija. Father Marcelito “Tito” Paez was a former parish priest in Gumbia and the regional coordinator of Rural Missionaries of Philippines in Central Luzon. In the 1980, he was the a leader of the Central Luzon Alliance for a Sovereign Philippines (CLASP), and campaigned for the removal of US military bases in Philippines. He was also an anti-nuclear activist. On December 4, at around 8pm, Fr. Marcelito “Tito” Paez was shot while driving his vehicle in San Leonardo, Nueva Ecija. He was shot by unidentified assailants riding a motorcycle. He was taken to San Leonardo Hospital where he died at 10.45pm. Earlier that day, Fr Marcelito “Tito” Paez assisted in facilitating the release of peasant organiser and political prisoner Rommel Tucay, who was detained at the provincial jail in Cabanatuan city. The climate of impunity that prevails in the Philippines has resulted in the serious deterioration in the situation for human rights defenders in the country. Defenders of economic, social and cultural rights, including land and environmental defenders, are among the most targeted groups. Filipino NGO Karapatan reported there have been 98 victims of extrajudicial killings between July 2016 and September 2017. On 28 November 2017, HRDs Elisa Badayos and Eleuterio Moises were shot and killed in the Negros Oriental province. Front Line Defenders strongly condemns the killing of Father Marcelito “Tito” Paez which it believes was solely motivated by their legitimate and peaceful activities in the defence of human rights in the Philippines. States around the world are failing in their duty to effectively protect people who defend human rights, leading to an escalation in preventable killings and enforced disappearances, Amnesty International said in a new report. The organisation’s new report, Deadly but Preventable Attacks: Killings and Enforced Disappearances of Those who Defend Human Rights, highlights the growing risks faced by human rights defenders – people from all walks of life who work to promote and defend human rights. Amnesty International is urging all states to prioritize the recognition and protection of human rights defenders. Authorities must publicly support their work, and acknowledge their contribution to the advancement of human rights.